STEVE IRWIN - The Crocodile Hunter ! Stephen Robert Irwin (22 February 1962 – 4 September 2006), known simply as Steve Irwin and nicknamed "The Crocodile Hunter", was an Australian television personality, wildlife expert, and conservationist. 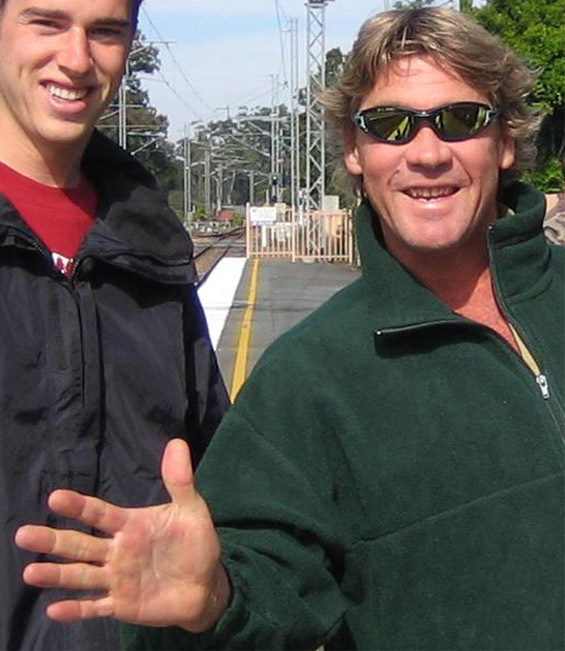 Irwin achieved worldwide fame from the television series The Crocodile Hunter, an internationally broadcast wildlife documentary series co-hosted with his wife Terri (née Raines). Together, the couple also co-owned and operated Australia Zoo, founded by Irwin's parents in Beerwah, Queensland. Irwin died on 4 September 2006 after being pierced in the chest by a stingray barb while filming in Australia's Great Barrier Reef. Please comment on his Palms ! Re: STEVE IRWIN - The Crocodile Hunter ! FastTimeBoy... thanks for your fabulous post!! 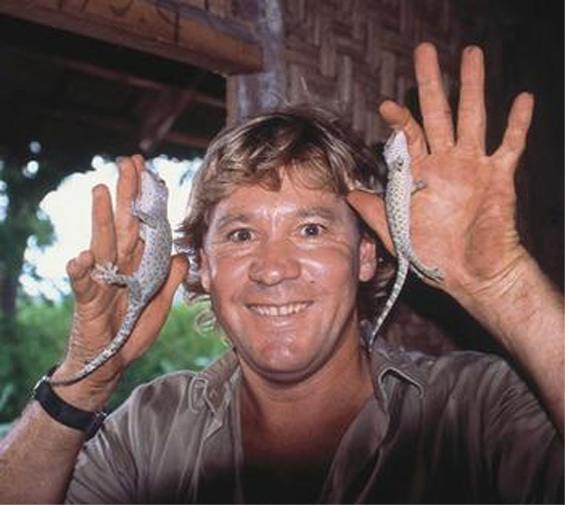 What are the typical characteristics in Steve Irwin's hands? Steve's hands are very typical for an 'adventurous' man: strong palm squarish palm - including a strong mount of moon, strong venus and strong mars-negative; he also has a low 2D:4D digit ratio, plus a strong, long pinky finger. And his bending, strong thumbs show his talent to share his enthousiasm for nature & his animals. She also starred Steve on his famous 'Crocodile Hunter' television nature documentary; now she's the owner of Australia Zoo (since Steve's death). Thanks so much for showing us these photos... It looks as though his head line may be well above the thenar line which increases risk taking activity, he has a surprisingly short index finger, long Apollo finger which also increases risk taking, and he would have been happy to leave the organising to Terri who has a very strong index finger. It would have been great to get a stronger photo to see the ridge patterns as I would be fairly sure he would have had a dowser's loop. A strong expressive thumb, and strong first phalanges indicate charisma and communication as dominant characteristics, though with the contracted third phalange on the Mercury finger this can indicate for me a black and white approach to issues. He has strong knuckles which on the second knuckles a need for order. A young 11 year old Asperger savant told me on the day that Steve died there were strong vibrations in the earth sphere which would have made animals tense and restless and she could not understand why he would have taken risks that day - not realising most of us are not sensitive to this.